Hey, guys, welcome to the first edition of the Sam Awards!!! We want to reward the best products related to Minetest in 2018. The most cool game of this year (from any year). 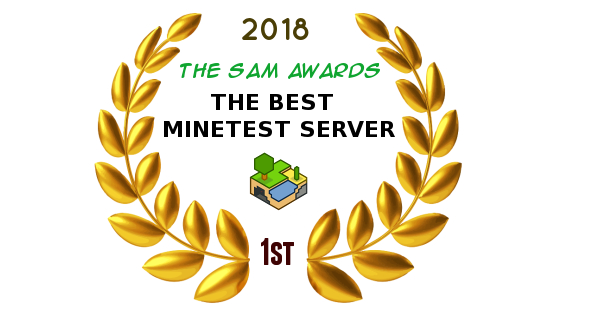 The most popular and better server of Minetest (from any year). -1 vote for each forumer. You must reply to this thread or through private message if you prefer. -You can vote to your favorites, in a numbered list format, up to a maximun of 3 in one, two or all the categories. -You can't vote for yourself if you are the modder, the game creator or server administrator. -It will win the first 3 scores of each category. Stickers: Gold, Silver and Bronze. Youtube appearance on the Sam Awards Winners Video. Last edited by runs on Sun Feb 03, 2019 00:07, edited 13 times in total. 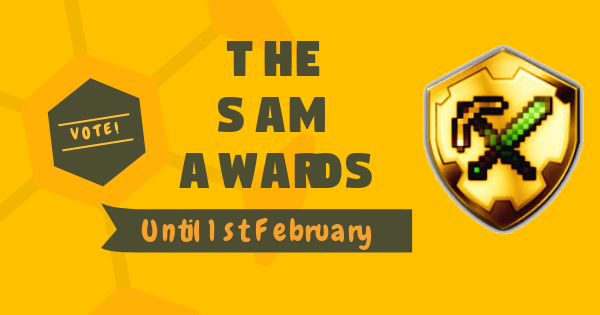 ۞ THE SAM AWARDS 2018 ۞ Vote! Oh, and in the picture it says 1th of February. Please change to 1st, I don't want to be rude but this mistake makes it look unprofessional. And I really like the idea of something like this. By stickers, do you mean actual stickers that will be mailed to a person or images that you could attach to your signature? migdyn wrote: Oh, and in the picture it says 1th of February. Please change to 1st, I don't want to be rude but this mistake makes it look unprofessional. Not to mention the Minecraft textures in the shield. Oh, I didn't notice them. migdyn wrote: And I really like the idea of something like this. By stickers, do you mean actual stickers that will be mailed to a person or images that you could attach to your signature? Images you could attach to your mod/game/server. 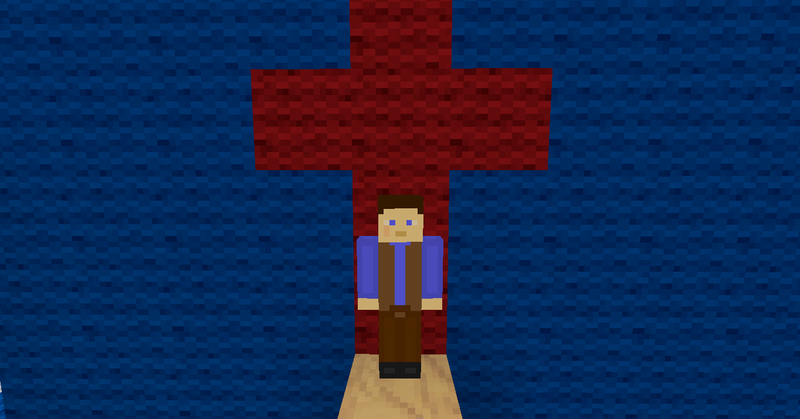 It could be Minetest textures too. They are generic tools. Does the server have to be started in 2018? Nope, server and game could be this year or older, never mind. 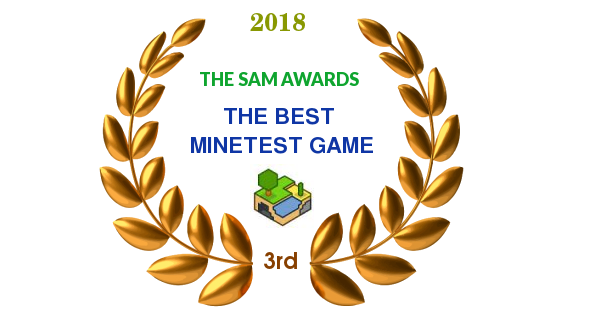 Best Minetest Game : KGM's LOTH, not on forums due to restrictive licensing, however. Only on GitHub. I have no clear opinion for games or mods. 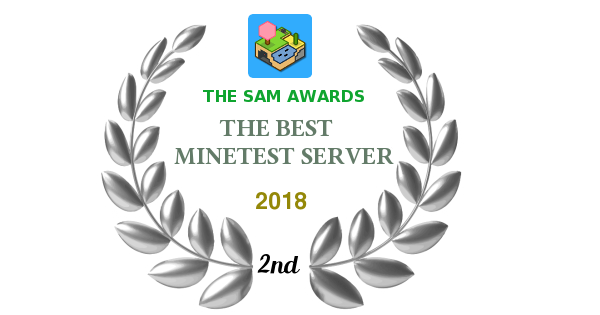 Best Server: i do not know!! It should also be "3rd" instead of "3th"
Mantar wrote: It should also be "3rd" instead of "3th"
Oh my... Another "th" on a number smaller than 4?! Oh, you have to understand that I do not speak English. I'm a Spanish guy. Ahh. I didn't notice any other language mistakes so I thought English is your native language. Poll option for thread? I think you can, or use another site to tally votes? Hmm, I dunno because I only played Minetest Game, and my Glitchtest based off from it. Ha! Same for the server, I only played on mine, and it's a 5.0.0-dev server too so it's usually empty anyway. 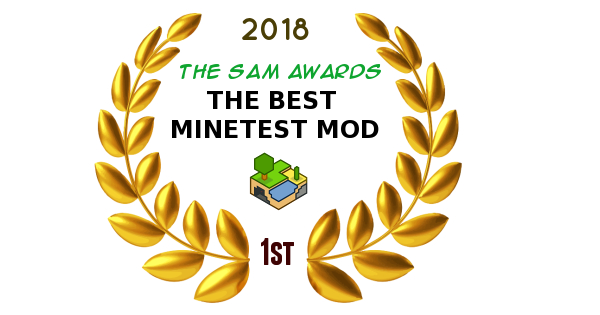 The best mod released in 2018? I don't think I played any, so from looking I'd just nominate/vote for Nathan.S' Tomb Stones mod. That's another thing, should there be nominees to choose from, instead of voting for any and all? It may help consolidate the results. jas wrote: Poll option for thread? I think you can, or use another site to tally votes? Hmm, I dunno because I only played Minetest Game, and my Glitchtest based off from it. Ha! Same for the server, I only played on mine, and it's a 5.0.0-dev server too so it's usually empty anyway. The best mod released in 2018? I don't think I played any, so from looking I'd just nominate/vote for Nathan.S' Tomb Stones mod. Poll has very limited amount of options to choose. It's better here = Transparency and free to anyone to vote all one wants. Then I would like to vote for everything, twice.